Henry David Thoreau was an American essayist, poet, practical philosopher and natural scientist, known for his doctrines of Transcendentalism. He is noted for his book “Walden”, a statement of simple living in a natural environment. His other important work, “Civil Disobedience”, is often cited as a vigorous advocate of civil liberties. Born in Concord, Massachusetts on the 12 July 1817, Henry David Thoreau was the third of four children to John Thoreau, a pencil factory owner and Cynthia Dunbar Thoreau. Henry attended Concord Academy in 1828 where he performed well. He continued his education, studying philosophy, science and mathematics at Harvard University between 1833 and 1837. After he graduated in 1837, Thoreau became a schoolteacher briefly before opening a grammar school himself in 1838 with the help of his older brother, John. While at Harvard University, Thoreau became friends with writer Ralph Waldo Emerson and joined the Transcendentalist New England movement, which celebrated individualism, nature and self-reliance. 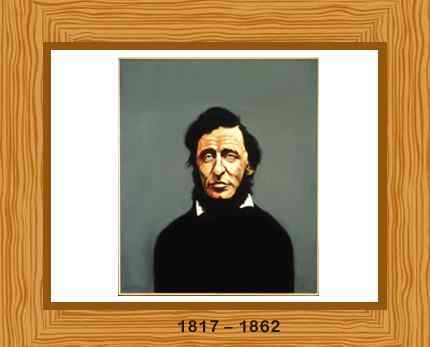 By the 1840’s the school had closed and Thoreau became a full time poet and writer. In 1845 he built a small cabin on the northern shore of Walden Pond, Concord and spent the following two years living a simple life in the second-growth forest around its shores. His famous book published in 1854 “Walden; or, Life in the Woods” is eighteen essays reflecting upon his two years of simple living in the natural surroundings. While living at Walden he spent a night in prison for refusing to pay the poll tax, an experience which resulted in his essay “Resistance to Civil Government”. Thoreau’s work consists of more than 20 volumes. A few of his extraordinary contributions include books and essays about natural history and philosophy, in which he analyzed the major sources of modern day environmentalism; ecology and environmental history. His philosophy of nonviolent resistance inspired such later figures as Mahatma Gandhi, Martin Luther King, Jr. and Leo Tolstoy. Thoreau highlighted the theories for human culture appropriated by the American natural environment. He is often classified as an individualist anarchist and a major source of inspiration for anarchists worldwide. Thoreau’s two legendary acts, his two years in a cabin he built near Walden Pond and his imprisonment for civil disobedience, typify his doctrines of New England Transcendentalism. After leaving Walden in 1847 Thoreau became a surveyor and on his father’s death he took charge of the family business. He found time to make visits to Maine woods and to Cape Cod which gave him further inspiration for his writings. He was an abolitionist all his life writing several works on the subject including his 1854 essay “Slavery in Massachusetts”. Thoreau spent the last years of his life at a home on Belknap Street, Westborough, where he had moved along with his family in 1850. He stayed there until his death from tuberculosis on May 6 in 1862.